These luscious cookies are made by rolling balls of dough in toasted almonds. 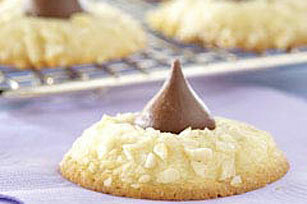 After baking, each is topped with a chocolate kiss. Preheat oven to 350°F. Beat margarine and sugar in large bowl with electric mixer on medium speed until light and fluffy. Blend in egg and almond extract. Add flour and baking soda; beat until well blended. Shape dough into 24 balls, each about 1 inch in diameter; roll in almonds. Place, 2 inches apart, on ungreased baking sheets. Bake 7 to 9 minutes or until lightly browned. Immediately top each with 1 unwrapped candy piece; press candy lightly into center of cookie. Remove to wire racks; cool completely. Store in tightly covered container at room temperature. Spread nuts on baking sheet. Bake at 350°F for 5 to 7 minutes or until lightly toasted.